Film Reviews: “…Comparisons dawn inexorably: how does Broken Marriage fare as a follow-up to the bravura of Relasyon? This is tough inquiry. If intentions were to be the starting point, then the new movie is a better achievement. Relasyon, judging from its title, was supposed to be about a man and other woman relationship; but the feminist tendencies of our cinema had pinned the movie to a fateful drift: the travails of the modern mistress. Broken Marriage never swerves from its goal; from start to finish it is a portrait of two persons and the bond which they discover smothering and smoldering. But the ordinary moviegoer does not assess by artist’s intentions – he does not even care about the artist (I mean here the one behind the work. On one hand, the film in front of him is the present; and on the other hand, it is the past. 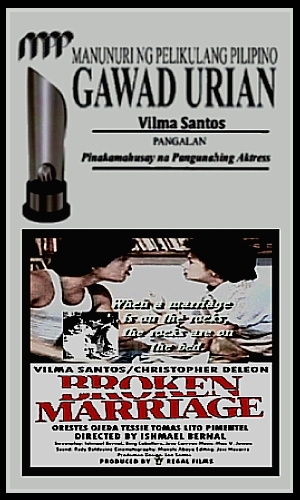 Broken Marriage is made to appear to him as a sequel to Relasyon. The process of integrating the past and the present is a challenge for him. For him are opened two avenues: to start with past and proceed with present; or start with present and proceed with past. If he chose the former, the condemnation for Broken Marriage would clang like a wild cymbal. If he chose the latter, the outcome is a laudatory comment). Nonetheless, one has to prove that the new movie can stand on its own feet. What Relasyon sadly lacked (albeit not too sadly) was humor. Broken Marriage has tons of it – the caustic swaps, the funny characterizations, the clever plottings – so that the audience’s conditioned response for a supposedly serious movie shifts irrevocably to playful irreverence. Vintage Ishmael Bernal. It is a masterly stroke – the proverbial Bernal sleight-of-hand at work, this time with more gusto and style. If the Inquisition were still around, he would be branded and burned seven times as a heretic for turning a marriage gone sour into an off-beat frolic suddenly turned sweet – at least, to the viewer’s mirth-hungry belly.